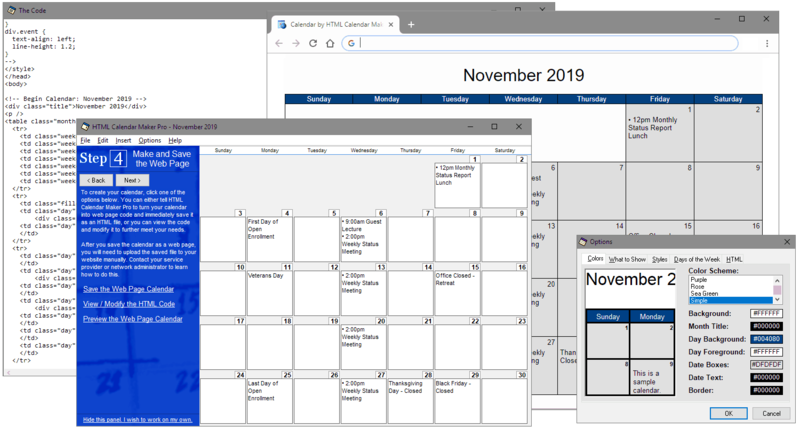 HTML Calendar Maker Pro for Windows was designed with ease of use in mind. Now you can type your events quickly and easily and they will be transformed into a customized and professional monthly calendar within seconds. Simply follow the on-screen tutorial to create your calendar and then place the finished web page on your site. It’s perfect for planning for the weeks ahead or noting past historic events. For more information on this program, check out the Online User’s Guide. There you can learn about the program in detail and read more about the many features in HTML Calendar Maker Pro. We know that you cannot simply look at descriptions and screenshots to determine whether a program will fit your needs. Try a full-featured version today by downloading it. Since it’s shareware, you’ll have a chance to make a number of calendars in order to try it out. There is nothing to lose but a few minutes of downloading time. If it’s something you’d like to continue using for your web site, you can purchase a registration code to unlock it using the Order Form. Plus, if you order a registration code today, future versions will be free. We also offer volume discounts. See our pricing page for more information. Download this award-winning program today!